Cecil Wilfred Pearson (1923-2011) was the son of Lionel Alphesis and Edna Rae (nee Robinson) Pearson. 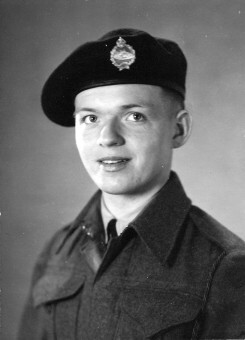 He enlisted in London, Ontario and trained at Camp Borden as a tank driver. Cecil was asked to learn Japanese but the war was over before this took place. During this time he married Reta Bull on March 24, 1945. Together they resided at Camp Boarden and upon his discharge in 1946 they moved to Kintore where Cecil took over the family farm. Together they raised five children - Murray, Penny, Jane, Ruth and Leah.